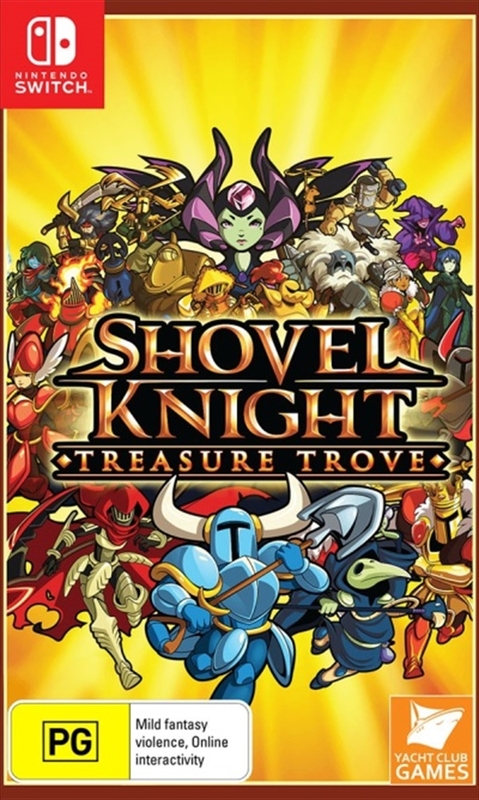 Shovel Knight: Treasure Trove is the full and complete edition of Shovel Knight, a sweeping classic action adventure game series with awesome gameplay, memorable characters, and an 8-bit retro aesthetic! Become Shovel Knight, wielder of the Shovel Blade, as he runs, jumps, and battles in a quest for his lost beloved. Take down the nefarious knights of the Order of No Quarter and their menacing leader, The Enchantress. Shovel Knight: Shovel of Hope - Steel your Shovel Blade and start digging through the adventure that started it all! Jump, battle foes, and discover treasures as you quest to defeat the Order of No Quarter and their vile leader, The Enchantress. Shovel Knight: Plague of Shadows - Prime your potions and become the maniacal alchemist Plague Knight in his adventure to brew the ultimate potion! Combine bomb parts to create custom combinations, discover new items, areas and bosses, and maybe even discover a bubbling romance. Shovel Knight: Specter of Torment - Summon your scythe in the prequel to Shovel Knight! Take control of Specter Knight to dash through completely redesigned levels by climbing walls, mastering a new arsenal of weapons, and slashing your foes to ribbons. Become the reaper, discover your melancholy past, and recruit the Order of No Quarter! Shovel Knight: King of Cards - Play as King Knight, the gilded goon himself, as he travels through 4 new worlds and more than 30 all new courses, on a journey to best the Three Kings who rule over the land. With a high-flying spin and a boisterous bash, he can crash through all who would dare stand in his way!